Or was he, like many others before and after, hoping for some peace and quiet, some respite from his daily affairs, here in Kororāreka? 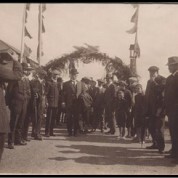 In April 1914, Prime Minister Mr. William Massey came to Russell. He’d been in the top job for two years by then, for two eventful years. According to one biographer, the government “led by Massey was marked by uncertainty, unscrupulous political manoeuvring, nasty intrigue, accusations of bribery, and bitter recriminations in which Massey himself indulged.” Massey’s leadership was tested very early in his first term. “The incoming Reform government was immediately faced with two of the major industrial disputes in New Zealand’s history: the 1912 Waihi miners’ strike and the 1913 waterfront and general strikes, which split the community into two irreconcilable camps. Massey… adopted a partisan position; the use of special constables, who became known as ‘Massey’s Cossacks’, earned Massey the undying hatred of many urban workers, an enmity passed on to their children. However, more conservative voters, especially in the farming community, saw Massey’s stand as firm and decisive, arguing that Massey simply took the ‘Red Feds’ at their word and met their revolutionary rhetoric and intimidatory tactics with superior force.” Did Prime Minister Massey know, as he strolled around Russell with his coat over his arm, that there would soon be more pressing business than the upcoming December 1914 general election? In August the First World War broke out. A year later Massey was still Prime Minister, but in coalition with the Liberals and Sir Joseph Ward. Apparently “Massey and Ward detested each other on personal, political and religious grounds and a decision to legislate only if there was unanimity in the coalition cabinet made the period of National government very frustrating for all involved”.